AudioGrail (Formerly K-MP3) is the swiss army knife for everything that is related to audio files (MP3, MPC, OGG...). It can very easily rename and tag (tag: info such as artist name, album, track title) your files automatically. It can also analyse quality, organize files on your system, find duplicated files and improve your everydays audio experience ! Supports : ID3Tag V1 & V2 tags, Vorbis (Ogg) comments and APEv2 tags. Automatically Albums Renaming & Tagging. 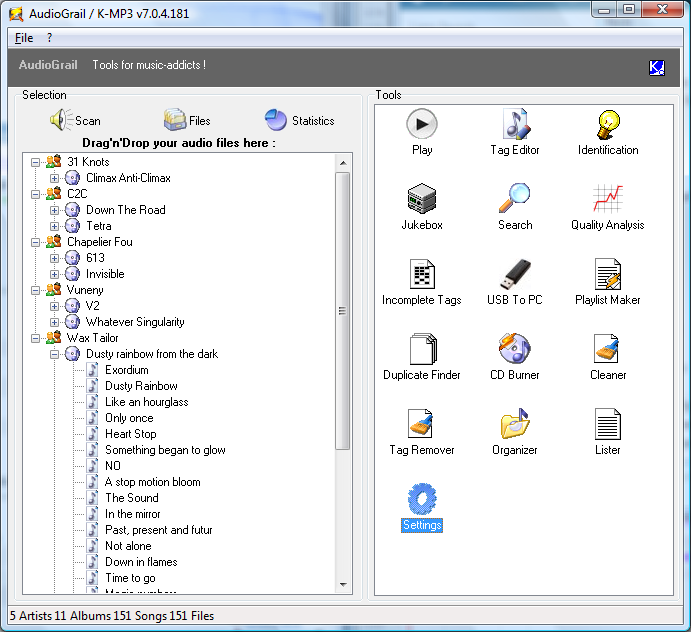 Audio files To Audio CD burning capabilities (requires CopyToDVD).